The great thing about RepRaps are that there are so many to choose from! 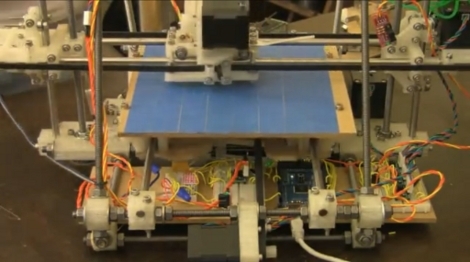 No matter what features or design intent you could want, there is probably a RepRap for that. Even so, there has been a recent addition to the RepRap family. Creator [jlguil] calls it the Case-Rap, and for good reason, the frame of the printer folds up into a suitcase. The Case-Rap is inspired by the Mendel90 which tries to improve on the original Mendel by replacing the threaded rods for a more rigid sheet material frame with bracing to keep the X, Y and Z axes perpendicular to each other. The Case-Rap goes a little further with the design to have the frame also perform double duty as a travel case. Check out the video after the break, the printer is actually built in 2 complete separate assemblies. The X and Z axes are mounted in a 4-sided wooded frame. The Y axis and the electronics are mounted on a 2-sided wooden frame. When the frame pieces are latched together in one orientation, they conceal the printer inside a suitcase-sized box. The latch positions were thoughtfully placed so the frame pieces could also be latched together in ‘printer mode’. Setting up and breaking down the printer takes all of 30 seconds. You may think a super portable printer has to be small… but you’d be wrong. The Case-Rap has a commendable 8x8x8 inch print area. According to [jlguil], the total DIY cost comes in around 350$ CAD, which is not too bad for a 3D printer, and pretty good for one that is unique, portable and capable. [Anton] has been doing some Commodore 64 Datasette experiments. He managed to connect the C64 audio traces to his smartphone and use it for tape playback. Not wanting to actually disassemble his Mendel 3D printer, [SteveDC] figured out how to make extenders that increase his build height by about 40%. We have fond memories of owning an 8088 PC. We did a lot of experimental programming on it but never anything as impressive as getting the TCP/IP stack to run on it. Then again, we’re not sure there was such a thing back when we owned the 10 MHz hardware. That’s right, the microcontrollers we mess around with now days are much faster than that old beast was. When he goes running at night [Tall-drinks] straps a pico projector to his chest. We guess you’d call the readout a heads-up display… but it’s really more heads-down since it’s projecting on the pavement. See how things heat up as a Raspberry Pi boots. This video was made using a thermal imaging camera to help diagnose a misbehaving board. We don’t have very many trinkets on our desk (that would steal space normally reserved for clutter). But be would happily make room for this motorcycle model made from VCR parts (translated). 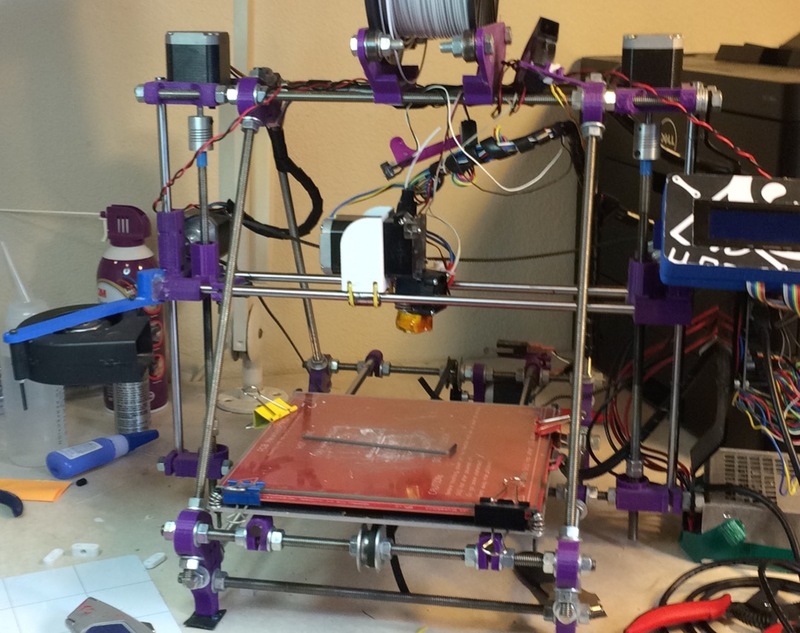 Hey everybody, [Nbitwonder] is building his own RepRap 3D printer. What’s special about that? Well, not much and and lot all at the same time. The art of building a self-replicating 3d printer still has a lot to do with luck and forum-crawling to make all of the decisions that go into this complicated project. Back in March [Nbitwonder] did a collaborative project over at Thingiverse and scored himself a set of printed parts from a guy who already has one of these printers. He then order a set of the non-printable hardware and has since been assembling it. If you’re interested but haven’t already taken the plunge, there’s enough pictures and information in this set of posts to satisfy your craving… for now. We say this build is an art because it goes beyond just plunking the pieces together. Take the print head, for instance. Instead of going with the extruder that is considered the default for a Mendel build, [Nbitwonder] is working on a variation called Greg’s Hinged Accessible Extruder. 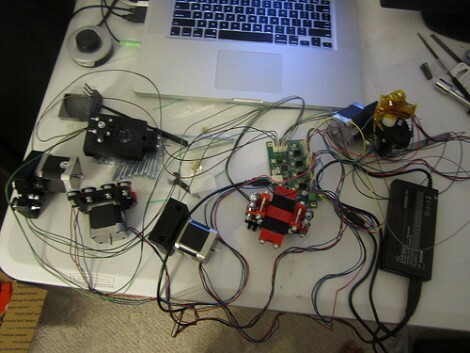 We can’t wait until the hardware assembly is done, because it’s the calibration that really interests us. Okay, it’s more like the 23 days but who’s counting? 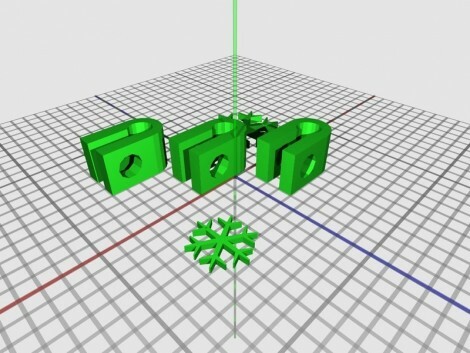 [Kliment] is giving the gift of self-replication this holiday season by uploading one new printable part a day. If you follow along and print each one you’ll have a Prusa Mendel by Christmas (this started on 12/2 so you’ll need to catch up). The Prusa is a variation on the Mendel that uses bushings wherever possible, reducing the need for bearings down to just two. So yeah, you need to have access to a 3D printer in order to make the parts for this 3D printer, but that’s how it always works. [Kliment] has gone the distance to make this little exercise enjoyable. The parts that take longer to print are reserved for the weekends, some have been altered to include a holiday theme, and all of them have been optimized to fit on a Makerbot build platform.